After 3 months of hard work DP Galyna competed walk to work campaign for Ambau. Ambau originally designed, build and installed the 54 monopiles and transition pieces for the windpark. The project was part of the commissioning of the windfarm. DP Galyna was selected due to its previous track record with Ambau. When Ambau used the vessel in 2016 they were very satisfied about the performance. Especially since the vessel made more than 50 individual gangway connections per day. This meant Ambau could really make good progress. Also the low fuel consumption of 3 m3 per day made the cost were kept in hand. Therefore Ambau decided to use the DP Galyna in 2017 again. In light of the upcoming winter a flexible scheme was laid out to make work in the fall worthwhile for both parties. Part of the project also included a feasibility study and test runs to see if the DP Galyna could safely work under rotating turbines. Also this project was deemed successful. All vessel equipment performed normally when close to a working turbine and all safety distances could easily be adhered to while under the turbine. This means in future the vessel could be used for works under working turbines. Now DP Galyna will go to dry-docks for its five year special survey. Sister vessel DP Gezina is prompt available in the Netherlands. The contract was concluded with the help of Globel Renawable Shipbrokers. GRS is shipbroker with offices in Germany, UK, France and the US, specialized in chartering for the renewable industry. Ambau is a Geman contractor with 4 production sites and 7500 employees. It is specialized in the production and installation of monopoles, transition pieces and other structures for the offshore industry. Nord See One is a joint venture between Nortland Power Inc from Canada and RWE Innogy from Germany. The windpark consists of 54 wind turbines and will provide 332 MW of clean electricity for Germany, enough to power 400,000 homes. Chevalier Floatels is an owner and operator of accommodation vessels and barges. 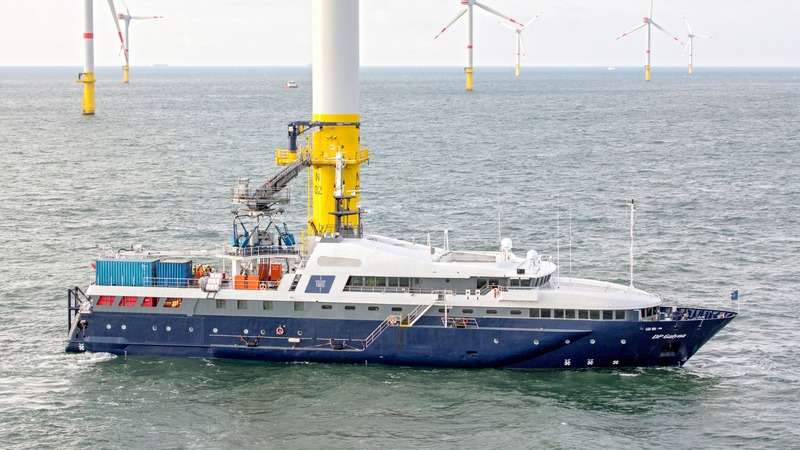 It owns two offshore support vessels with Ampelmann gangway. It has competed over 30 walk to work project in both the renewables and the oil and gas industry.